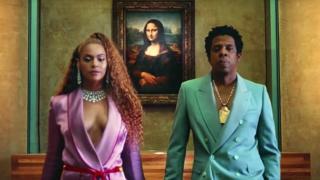 A Beyoncé and Jay-Z music video helped the Louvre in Paris increase its visitors to a record 10.2 million in 2018. The Louvre also credited the large increase in visitors to its Delacroix show - the museum's most popular exhibition on record. An upswing in foreign visitors to the French capital was another contributory factor to the 26% rise in admissions. Tate Modern was the most visited UK museum, according to The Art Newspaper. The Thameside gallery knocked the British Museum off the top spot, a position it had held for the previous nine years. London's Victoria and Albert museum also reported a record year, with 3.9 million visitors. Last year it dropped to sixth in the rankings, while UK museum and exhibition figures overall were 5% down from their highpoint in 2014. Across the Atlantic, the Metropolitan Museum of Art in New York staged the two most popular exhibitions in the world in 2018. Heavenly Bodies: Fashion and the Catholic Imagination, a show that mixed religious artworks with haute couture, was seen by nearly 1.7 million people. The second most popular exhibition in 2018, which attracted more than 700,000 visitors, was Michelangelo: Divine Draftsman and Designer. The Smithsonian's National Portrait Gallery in Washington DC attracted more than 2.3 million visitors last year, a surge of 1 million compared with 2017. The institution has largely attributed the rise to the unveiling of two portraits of President Barack Obama and his wife Michelle, by Kehinde Wiley and Amy Sherald respectively. Beyoncé and her husband Jay-Z launched their Everything Is Love album last year with a six-minute video shot in the Louvre by director Ricky Saiz. The Art Newspaper's annual visitor figures survey highlights global trends across the museum sector.